This highly personalized facial is custom blended to meet your exact needs, every time. 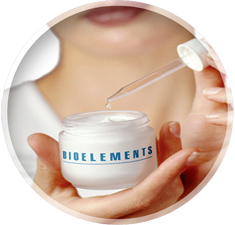 It starts with a Bioelements Skin Reading then each step is customized with advanced ingredients and aromatherapist oil uniquely designed to deliver results. You'll experience deep cleaning, a custom blended facial massage, plus a serum and mask targeted to your specific skin concerns. A customized treatment designed to keep your skin looking its very best. We'll start with deep cleansing and exfoliations to target any breakouts, blackheads and ingrown hair. Next, a custom blended Bioelements mask will be applied to soothe, balance and tone your skin. All this, plus a relaxing massage of the face, neck and shoulder. You'll emerge looking and feeling like a million. An absolute must if you're breakout-prone, have clogged pores or blackheads. You'll receive a personal Skin Reading followed by deep pore cleaning, exfoliation and a medicated Amino Mask that contains enzymes, antioxidants, antiseptic and anti-inflammatory ingredients. Make this effective treatment a part of your continuing fight against acne. Buy the table, the most important, of course, Rolex, especially this price. Many people think of Rolex, the first is possible with rolex breitling watches a calendar Black Ghost, or the ghost like green, but I would like to recommend is the only version of the calendar kelpy. Why is it, first from the price, 114060 cheaper than the 116610LN about 4500 yuan, though not many, but only by a breitling replica uk daily calendar, if not very necessary, no calendar version is good, after all, Rolex calendar a small problem is not less, no more worry calendar. Secondly, now with a calendar drowner is really difficult to buy, no money to buy a relatively good calendar. Third, the rolex five letters calendar Blackwater ghost, because many people buy, wear more people, too easy to hit the table, no calendar, seems a little bit different.